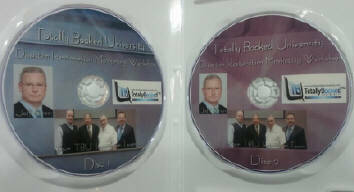 The TBU Disaster Restoration Marketing Workshop on 2 DVDs! A 2-DVD set with a full-day of live recording of a training event for restoration business owners and managers. Topics include social media marketing, website and Internet marketing, assignment of benefits, legal issues facing restoration contractors, marketing to adjusters, working with insurance agents, hot topic questions and much more! Peter Crosa and all three brought several fantastic and effective restoration marketing and management programs to one location and recorded the entire event... and now it is available to you to watch and learn. The session is geared to helping you create a competitive and profitable restoration company. You will learn how to get more jobs, earn more money, negotiate with insurance companies, "get in" with adjusters and much more. If you want to know your legal rights as a restoration contractor and learn how you can earn more money and collect what's owed to you from insurance companies, this is the DVD set for you. Harvey Cohen, an attorney who specializes in insurance claims, presents valuable information that any restoration contractor business owner needs in today's tough marketplace. If you want to know how insurance adjusters think and how they differentiate the restoration contractors they prefer to do business with, this DVD set is for you. Peter Crosa, a nationally-known insurance claims marketing expert, knows what it takes for restoration contractors to be successful and he shares his strategies. of Cleanfax magazine and creator of Totally Booked University, presents practical, easy-to-implement steps for better online exposure. Bonus: At the end of DVD #2, a special Q&A session is included. Don't miss it! Order your two-DVD set using this PayPal Add to Cart option (or use the Credit Card form to the left). In two to three business days, your DVD set will arrive and you can view a live recording of one of the best marketing workshops in the disaster restoration industry. You will also receive, via e-mail, a PDF of the social media and website presentation from the DVD. This way you can see and use the links referenced in the workshop. Links extremely valuable for your online marketing efforts!